When it comes to the St. Louis beer community, you can count on them to be the kind of neighbors we all wish we had. When the news broke that Stray Rescue of St. Louis, a popular no-kill animal shelter in downtown St. Louis had experienced an outbreak of distemper, a viral canine disease that has killed 18 dogs over the past few days, their neighbor Schlafly Beer decided to act. In an effort to raise $5,000 for the shelter, Schlafly will be making thousands of beer biscuit dog treats with 100% of the proceeds going to the Stray Rescue. The Schlafly Oatmeal Stout Beer Biscuit bags will contain five biscuits made with the brewery’s Oatmeal Stout and other from-scratch ingredients. They will be sold at both locations of Schlafly Tap Room (2100 Locust St, St. Louis, MO 63103) and Schlafly Bottleworks (7260 Southwest Ave, St. Louis, MO 63143) for $5.00. 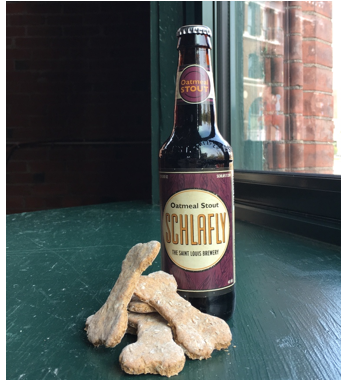 The Schlafly Beer Biscuits are made with a little bit of Schlafly’s Oatmeal Stout, spent grain (which is typically recycled to farmers for feed after the brewing process), peanut butter, flour and eggs. Note: the amount of beer is very minimal. All alcohol cooks out in the baking process and will not harm any dogs.